Baruch College is one of the nation’s “Best Value” higher education institutions, according to The Princeton Review in its 2019 annual guidebook that profiles 200 schools based on their academics, affordability, and career prospects. Only 7 percent of four-year colleges across the U.S. were selected for Princeton’s Review’s The Best Value Colleges: 200 Schools with Exceptional ROI for Your Tuition Investment. Among the 200 colleges featured in the book, 137 are private and 63 public. Baruch College placed #48 in the guidebook’s main ranking list, “Top 50 Best Value College,” while also garnering accolades in numerous areas ranging from strategic location, to impressive internships, to excellent professors. Meanwhile, students said Baruch provides “several amazing resources such as peer counseling, the writing center and tutoring” that helps if they are struggling. Additionally, students added that Baruch has “excellent professors who have a passion for what they teach” who readily bring their “first-hand experience” into the classroom. 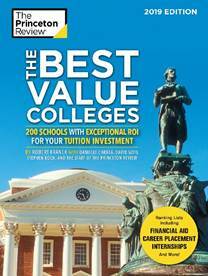 The “Best Value Colleges” list is based on a combination of institutional and student survey data, including academic rigor, affordability, and career outcomes for graduates, among others. All 200 schools featured in the book were chosen based on a comprehensive analysis of data from its surveys of administrators at more than 650 colleges in 2017-18. Survey topics included academics, affordability, financial aid, career outcomes for graduates, graduation rates, student debt, and alumni support. Read more here.